I live in a small city, but one with plenty of bike lanes. Drivers and cyclists coexist with relative peace, and it’s one of the safest places to cycle in the world. But have I nearly been wiped out a number of times? You bet. And it usually happens because the car can’t see me. It’s a tough go as a cyclist. Not only are you sharing the road with bigger, faster vehicles, you’re also difficult to see and far more vulnerable to injury if you get into an accident. I don’t say this to discourage your cycle commute, because I truly believe the pros heavily outweigh the cons, but it’s the reality. I’m a fan of any piece of gear that improves your visibility and safety. So when RideOut Technologies asked me to check out their Firefly turn signal handlebar grips, it was an easy yes from me. Yep, they’re grips with a signal light that you can control. So how do the Firefly grips work? 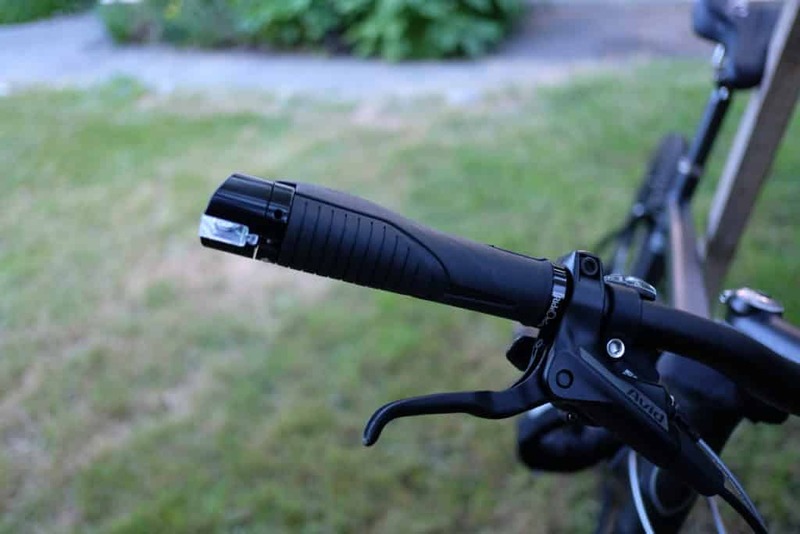 The RideOut Technologies Firefly are a set of contoured bike grips with built-in turn signals. The Firefly are a very smart design. Engineered to fit modern standard handlebar dimensions (22mm), you simply need to remove your old grips and slide the Firefly into place. Unlike standard friction grips, the Firefly is attached using a small hex bolt. Another size is used to remove the battery compartment, so if you’re making this purchase it’s a good idea to have a set of Allen keys on hand. A close-up of the grips in action. They will fit most 22mm straight or riser bars. Coming from a simpler set of grips, the Firefly feel noticeably premium. Constructed from high-quality plastic, rubber and metal, they’re very reassuring in your hand. A nice wide end gives your hand something to naturally rest on. The entire design is nicely ergonomic and should fit hands of all sizes. They look good too. With a neutral black design they’ll fit virtually any bike style seamlessly. 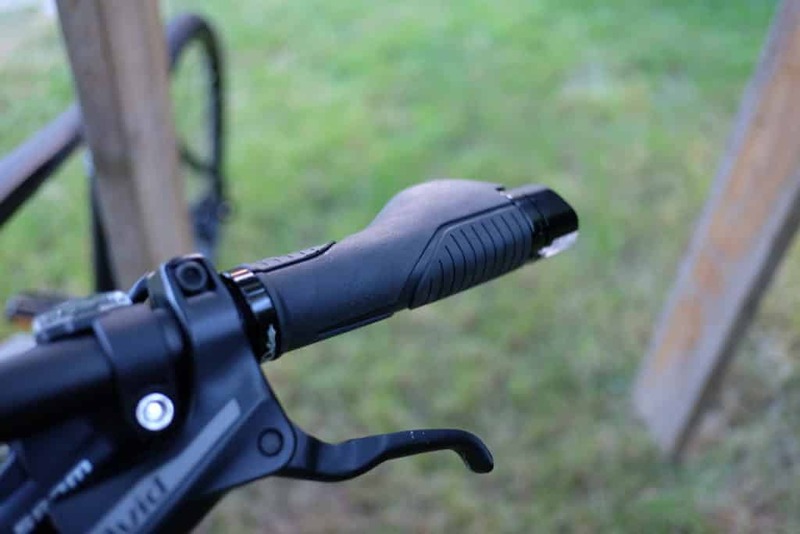 The turn signal button itself is hidden right where your thumb rests underneath a raised, rubberized pad. You press with your thumb to turn on the signal on that side, and again to turn it off. There’s no click or audible sound to the light, so you’ll need to keep an eye on it and be sure to turn it off again once you’ve completed your turn, otherwise you’ll confuse drivers. They do switch off automatically after 30 seconds, but if you’re a fast cyclist like I am you could be a block away by then. It kind of goes without saying, but the Firefly won’t work with bullhorn or curly drop handlebars. You’ll want straight bars or risers because these grips are built to sit on the bar ends. Here’s a front view of the Firefly. Note the translucent portion: that’s where the signal is visible to incoming traffic. 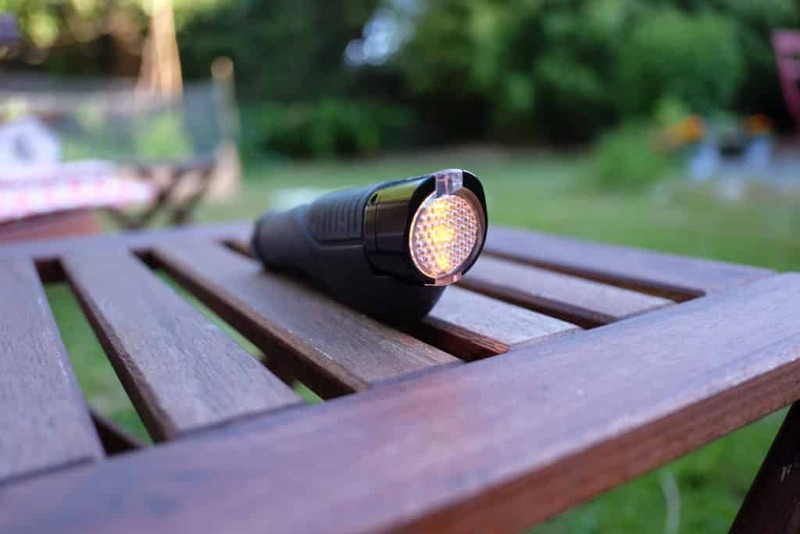 The light is a bright, amber LED that won’t use up much power. 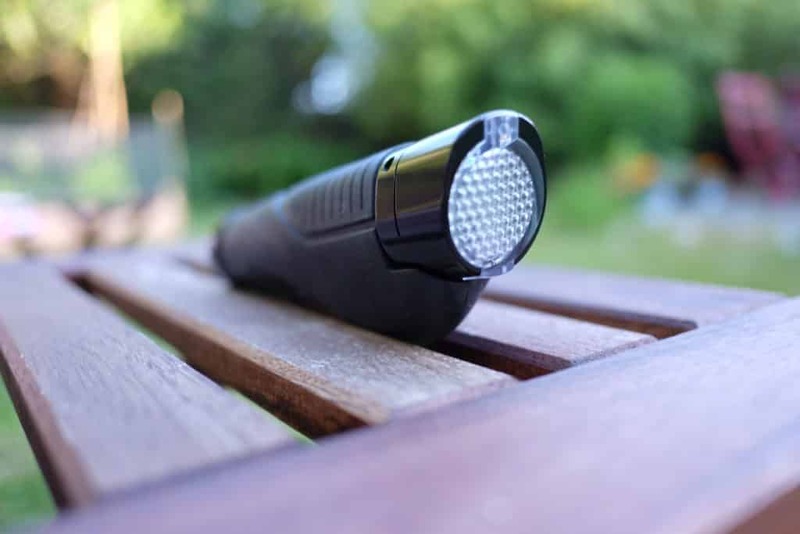 It runs on a pair of AAA batteries (included) and they should last a long time. Once activated, the light blinks like a car’s turn signal until you press the button again. The light housing is angled backwards, so vehicles beside and behind you will be able to see the light. The housing wraps around to the front a little so that your signals can be seen from head on as well, though it’s slightly less visible from that angle. It’s hard to see in full sun, but the light is a bright amber LED that’s especially visible at night. The handlebars are built to withstand shocks and bumps. I can attest to their durability because my bike fell over during installation and it landed right on one of the grips. Ugh. But to my surprise the Firefly didn’t have a scratch on it and it worked perfectly despite the shock. They’re also weatherproof. We’ve had uncharacteristically good weather so I haven’t been able to test a rain ride yet, but after close inspection I doubt rain would be an issue since the electronic componentry is nicely sealed. It’s hard to explain how awesome it is to be able to signal directionally without taking your hands off the bars. We take turn signal lights for granted in a car, but it’s a super smart addition to a bicycle too. I had a lot more confidence when taking turns in traffic knowing that the vehicles behind me could see my intention in a manner they’re accustomed to. That’s huge. Usability is pretty excellent. My only complaint is that it’s sometimes hard to know if you’ve properly activated the signal, so it’s worth double checking. Here’s the turn signal in action. The RideOut Firefly turn signal handlebar grips review really well, and I do think they’re a very effective piece of safety equipment. They’re comfortable, they look really nice on the bike, and they are really, really useful. That all said, they have limitations. Vehicles need line of sight to your handlebars to see your signals. Also they’re less visible during the day than at night and thus I’d still recommend pairing their use with your standard hand signals to maximize your safety. Do I think they’re a worthwhile purchase? Absolutely, and especially for daily commuters who spend a lot of time in heavy traffic. And they are a worthwhile investment for kids too; it’s a great way to initiate a young bike rider into thinking about safe riding practices and visibility to cars. You can pick up a set for $45.75 at the RideOut Technologies website. What a fantastic idea and great product! Wish I’d thought of it.